A red dot sight (also called optical scope) is an optical accessory used in conjunction with devices whose main functionality is aiming/targeting. Devices like telescopes and cameras use red dot sight, but they are mainly popular with firearms. 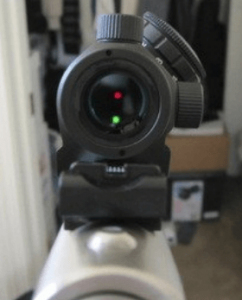 A red dot sight generally uses a LED lighting system to create a reticle that has an illuminated red dot that is aligned with the firearm in order to keep an accurate aim on the target. Why do you need a red dot for Your AR15? If you are a shooter/hunter, you would love to have a firearm accessory that increases your ability to shoot accurately. A red dot sight for your AR15 will enhance your shooting capability- ideally with your both eyes open, for targets within 100 yards range. However, red dot sights can perform brilliantly for even longer ranges as well. With a red dot sight, you will have an enhanced target attainment, and you will also be able to maintain accurate and lasting zeroing. A red dot sight that is light in weight, durable and efficient battery use will have significant effect on any hunter’s shooting experience. With a red dot sight for AR15, you can be sure that you will have better target acquisition and sighting. While choosing a red dot sight for AR15 can be a bit confusing,, we reviewed the best red dot sight for AR15 under $200. For anyone who wants to use a reflex sight, the main qualities that s/he seeks are that it should be light, and the optics should be clear and smooth for both light and dark conditions. Dagger Defense DDHB Red Dot Reflex Sight is a first-class red dot reflex sights with all of these qualities. It is an affordable firearm accessory that can withstand all types of shooting conditions. Made from a tough material that ensures durability, Dagger Defense DDHB Red Dot Reflex sight uses a square-shaped window with a red and a green dot that operates with a carefully designed four patterns reticle. 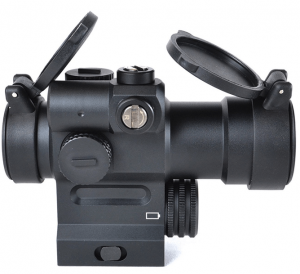 The optics of this red dot sight is designed so as to adjust a wide range of brightness conditions ranging from dim to bright. For any AR15 enthusiast, this is a very serviceable and inexpensive choice. For your casual hunting, the build and optical performance of this budget friendly accessory will be a great asset. This device aids you with comfortable and quick transitions.Dagger Defense DDHB red dot sight is hence a best buy for budget hunters. For anyone who has a brief experience of the shooting and hunting life, a red dot sight like Vortex Optics StrikeFire 2 Red/Green Dot Sight with Cantilever Mount is a perfect firearm accessory. Designed elegantly and priced on the upper limit of other budget friendly red dot sights, this device offers excellent split-second target acquisition and maximum field of view. 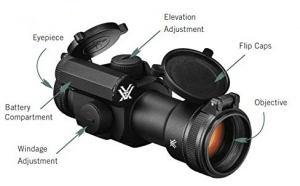 Vortex Optics (SF-RG-501) features sleek rear-facing controls for power on/off and easy adjustment of ten dot intensity levels out of which the lowest two settings are night-vision compatible. The body is supported by 30mm aluminum alloy chassis that offers extra-high recoil rating and makes it waterproof and fogproof. With StrikeFire, you will strike like never before! Another advantage of owning this highly recommended accessory is that it comes with a lower ⅓ cantilever mount model that is ideal for rifle platforms where you need to position the optic bore center 40mm above the base surface. Outstanding battery life of upto 6000 hours at minimum brightness. O-ring seals for preventing moisture, dust and debris. Vortex Optics StrikeFire 2 Red/Green Dot Sight with Cantilever Mount (SF-RG-501) has outstanding qualities for its price, and can aid on the shooting experience of hunters. 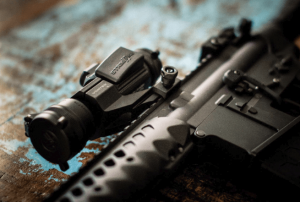 With a build that can sustain varied weather and lighting conditions, you should definitely go for this red dot sight if you are looking for stepping up your shooting spree. Bushnell is a well-known premium name when it comes to outdoor gears and optics like scopes, binoculars and sights, and Trophy Sight Riflescope is one of their finely designed products that you can use with your firearms like AR15. This red dot sight is comparatively smaller and lighter than others in the market. With weight less than a quarter of a pound, this sleek red dot sight can be easily used with a rifle or a handgun. This sight offers 1×25 power, and it is programmed with 11 brightness levels that work very well under all light conditions. 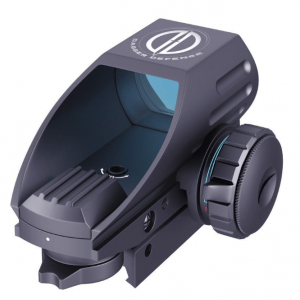 It is very easy to set up and zero in, and the optics offer a clear and crisp view. This equipment functions equally well under weather conditions that are over cast and low-light to guarantee that you wouldn’t have to compromise on your side while hunting. With the 11 different settings available for adjustment, you can make sure the device is optimized for field conditions. Bushnell TRS is not popular only because of its functionality, its light-weight gives an added advantage to the shooters. It is less than half as heavy as most of the traditional red dots available in the market. On a rifle like AR15, it will apparently be unnoticeable when weight is considered. 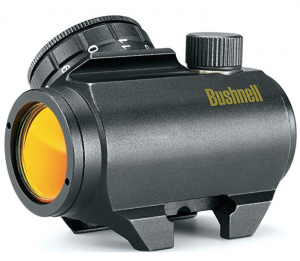 Bushnell has gone one step further to minimize the parallax shift on this device by incorporating narrow tubes into its design. With fine and sturdy brightness knob, you can easily switch your brightness levels. Perfectly complements AR15 flat-tops and tactical shotguns. The construction of the TRS-25 is fog, shock and water-resistant and makes this gadget great to use in any conditions. The scope comes with a mount. Bushnell Trophy TRS-25 is a solid option for budget shooters. For it’s given price, there is nothing that could’ve been better for its function and durability. If you’re looking for a good range optic at a reasonable price, you should surely choose Bushnell Trophy TRS-25. Whether it be veteran hunters or newbie shooter, AT3 has established itself as a manufacturer loved by all. AT3 LEOS Red Dot Sight with Integrated Laser & Riser is one of AT3 product that has been loved by the users of AR15 rifles. Ideal for home defese, tactical and law enforcement, competitive shooting or hunting, this device will enhance your efficiency. This red dot sight has been optimized for AR-style rifles, sporting and hunting rifles, shotguns, air rifles and any other arm with a Picatinny or Weaver mounting rail. This red dot sight offers crisp 2 MOA red dot with 6 brightness settings for accurate shooting with both eyes open. It is extremely easy to maintain zero even when used with high-caliber weapons. Another brilliant feature of this device is that it consists precise digital control of light, along with a laser-switch between red dot only, red dot and laser, and laser only modes. 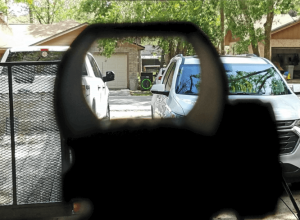 This makes AT3 LEOS Red Dot Sight a very versatile sight. This red dot sight comes with an integrated screwdriver that makes tool-free windage and elevation adjustment very easy. A spring assisted flip-up cap provides ultimate protection of the lens that goes hand in hand with highly durable 6061 aircraft standard aluminum housing. The stealthy matte-black hardcoat and anodized finish makes this equipment fully waterproof and fogproof. For people seeking to add a red dot sight to their arsenal, AT3 LEOS Red Dot Sight with Integrated Laser & Riser is a perfect blend of versatility, durability and accuracy. If you’re looking forward to step up your hunting and shooting experience, this is a perfect red dot sight at a reasonable price. 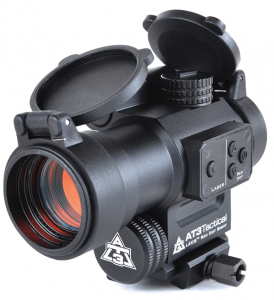 I recommend the AT3 LEOS Red Dot Sight because of it’s price and quality. Go back to read more reviews about scopes.